Jogja International Heritage Walk (JIHW) is an international walking event held by Jogja Walking Association as the organizing committee, which concept covers not only health, but also green environment, education, communication, tourism, and economy. University Muhammadiyah Yogyakarata (UMY) as one of the largest campus in Yogyakarta in receiving inbound students from many partners around the world. Counted from the nearest, the inbound students came from Malaysia, Singapore, Thailand, China, South Korea, United State, and so on. 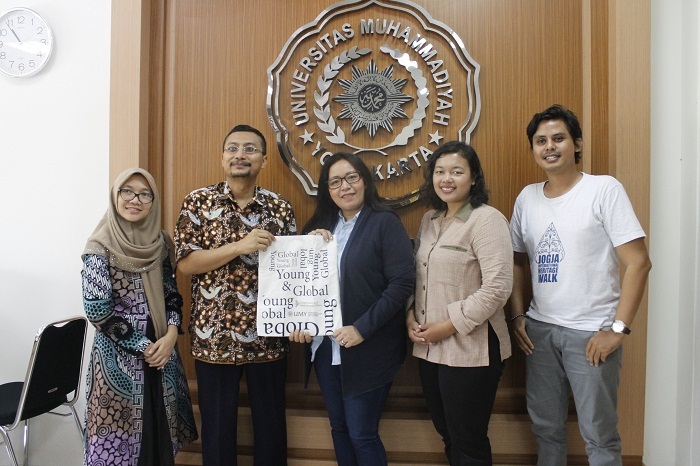 Therefore, Jogja International Heritage Walk visited and arranged a meeting with UMY on Friday (26/10). The visit was meant for a cooperation planning regarding to the number of UMY’s Inbound. “In line with our campus tagline muda dan mendunia” or young and global, we already have hundreds inbound student from around the world from our international partners and we still opened any cooperation to support our vision” said Eko Priyo Purnomo as the Executive Director of International Cooperation and Affairs. As an organizations that held international events, JIHW interested to cooperate with UMY to support its mission in promoting Heritage Walk for international scale. After a moment of introduction and proceeding to main discussion, both parties agreed to move to another step of cooperation. Dahlia Puspa Sari as the representative of JIHW relieved her gladness towards the next step of the cooperation. “Im really glad UMY responded to our cooperation invitation. It means a lot since JIHW is still keeps enhance our events, and cooperation with UMY at least make our next step easier” she said.